Discussion in 'Pictures & Stories of My Chickens' started by happymorrows, Jan 3, 2011. 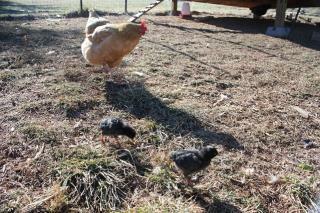 The chicks have flown the coop! 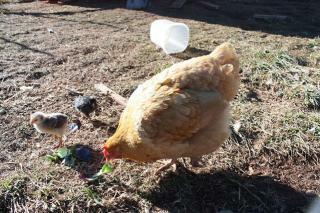 The babies that hatched on the 20th have finally ventured out with mama hen into the yard. The other hens and the rooster do really well with them. They run around under everyone's feet and are doing great! How much fun in the new yard. You must be proud! Wow. We're up in NH and won't be seeing our yard for at least another 6 weeks. Your photos give me hope. Oh - so sweet! Thanks for posting the pics! That's beautiful! How cold is it in NC? I'm so surprised to see chicks this time of year! Quote:6 weeks!!!! I'm in mid-NH and don't plan on seeing a yard until at least the beginning of April. You must be near the coast? We have cold snaps that go below freezing, and it is below freezing at night (mid twenties). But most days it is in the 40s or so.